Hundreds of South Korean protesters attend an anti-government rally in downtown Seoul, South Korea, Dec. 19, 2015. Blowing horns and banging on tambourines, thousands of South Koreans marched in Seoul on Saturday to protest the arrest of a labor union leader who may face a rarely used sedition charge over the eruption of violence at an earlier anti-government protest. The demonstration was the latest in a series of mass protests in recent months of conservative President Park Geun-hye. She has been criticized for her increasingly harsh treatment of union members and dissidents resisting her drive to make labor markets more flexible. The demonstrators, also carrying banners and handheld signs and shouting for Park to step down, marched through downtown streets as large groups of police officers moved along and kept them at close watch. The walk brought the demonstrators to an area near a hospital where a 69-year-old protester remains in a coma after being injured during a huge rally on November 14, when dozens were hurt in clashes with police. Police said about 2,500 people participated in Saturday's rally. The crowd was significantly smaller than the protest in November and a peaceful follow-up demonstration on Dec. 5, which drew a combined total of more than 80,000 people. 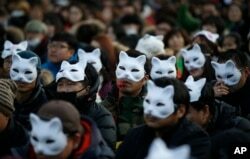 South Korean protesters wearing half masks attend an anti-government rally in downtown Seoul, South Korea, Dec. 19, 2015. Park's government has clamped down on labor and civic groups involved in organizing last month's rally, holding them responsible for the violence. Prosecutors are considering indicting arrested Korean Confederation of Trade Unions President Han Sang-gyun for sedition, a charge unseen in South Korean courts since the 1980s, when the country was under military dictatorship. Under South Korean law, sedition is punishable by up to 10 years in prison. The government's tough stance on protesters has added concerns about what critics see as Park's unwillingness to tolerate dissent. Prosecutors in recent months have pushed several criminal defamation cases against journalists and activists, who have been outspoken in their disapproval of Park. There is also widespread resistance to the government's decision to require middle and high schools to use only state-issued history textbooks starting in 2017, which critics say is an attempt to whitewash the dictatorships that preceded South Korea's bloody transition toward democracy in the 1980s. Park is the daughter of slain military dictator Park Chung-hee, who ruled South Korea in the 1960s and '70s, and whose legacy as a successful economic strategist is marred by a brutal record of civilian oppression.